Ultra-versatile asymmetrical crampon for use on anything from glacier travel to big mountaineering routes. Flat and ridged 2.6mm structure guarantees rigidity and longevity. Mixed binding system designed for boots with heel welt. 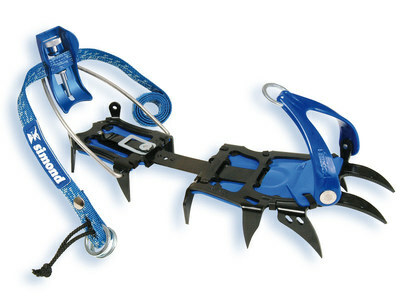 Comes with antiballing plates and crampon bag. Weight given includes antiballing plates. Asymmetrical Points: Asymmetrical points on inside edge aligned. Front points centered towards big toe. Holding point on outside edge as well as two holding points at back. Shaped to match the profile of boots. Adjustment of length: Tool-free adjustment of length with linking bar system designed to stop bar sticking out over the back of the crampon on small size boots. For shoes sizes 36 to 48. Ideal for rental.